The ELKOM preheating station MIKUTHERM OPTIMAL has been developed for economical, safe and protective heating of solid surface sheets as well as all thermoplastics, acrylic glass and similar material. It is the latest, most efficient and safest preheatingsystem on the market. Solid surface sheets and other thermoplastics must be heated carefully. Contact heat on both sides without application of pressure to the material is ideal. MIKUTHERM-OPTIMAL meets the requirements of the raw material suppliers and fabricators. 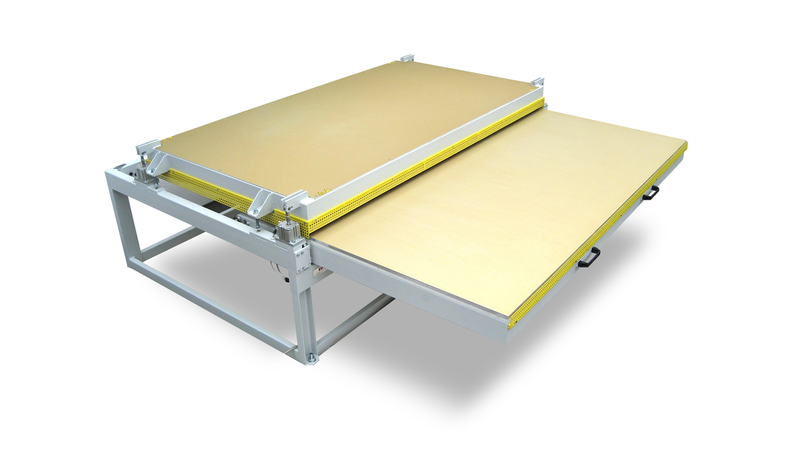 In contrast to conventional temperature control systems with folding-cover tables maximum safety is achieved with short and material-protecting cycle times. The preheating time for a 9 mm solid surface sheet is only about 10 minutes. The high-quality, gold anodised ELKOM heating platens ensure protection of the material, uniform continuos temperature and extremely long life. The solid surface sheet is held flat, but not pressed by the lowerable top table. - Easy access to material through ball-bearing guided drawer. - Only 5 seconds for opening and closing. No other technology is faster ore more efficient. - Heavy duty steel construction, tension free, for unlimited lifetime. - No handling between hot platens. - Automatic thickness adjustment, no risk of pressing or touching the precious material surface.